User feedback is the key indicator of customer experience. Having access to the customer insights puts you as a marketer at a competitive advantage. In fact, user feedback will also enable you to prioritise and address issues that surface, putting you one step closer to reaching a profitable conclusion and closing the loop. That is why it’s important to have the right user feedback solution in place, depending on your needs and of course, budget. In this article we will zoom in on several free user feedback tools that are great for digital marketers who are on a budget. Keep in mind that user feedback tools can be very diverse in purpose.They often use a variety of collection techniques, collect different forms of feedback, report differently and provide different kinds of insights to the user. To clarify, here is a breakdown of the user feedback categories featured in this post. Whether you’re a startup looking to keep costs down, a digital marketer who’s having doubts about which tool to use, or just a plain old penny pincher, we’ve got plenty of free user feedback tools for you to choose from. Let’s take a look. Voice of the Customer (VoC) tools are becoming a #1 priority among online companies – mainly because these types of tools have become a critical element in customer experience initiatives. VoC tools make it easy for visitors to communicate about their customer experience directly and avoid interrupting the online journey. They are also great for collecting ‘in-the-moment’ (or real-time) feedback. 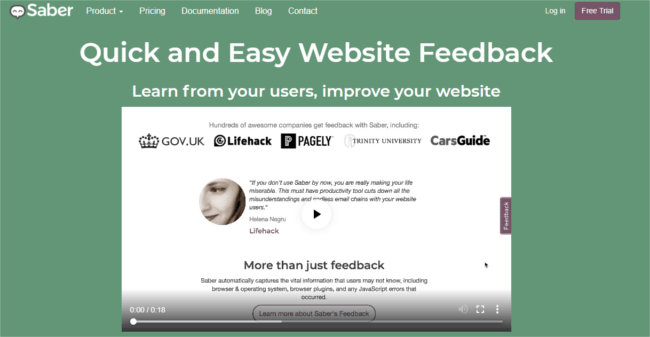 With Feedbackify you can create feedback forms all on your own, plus installation is very easy (copying and pasting the code into your website’s HTML). Your visitors can provide a rating as well as submit comments, including suggestions and compliments. You can also view all feedback received in a dashboard in real-time including filtering by category and sub-category. UserReport is a VoC tool that collects feedback in two different ways: via a survey or their feedback forum. The feedback survey works a lot like Feedbackify, but also offers Net Promoter Score (NPS) as a metric. The feedback forum, or community, helps users collect ideas and filter by popular, most recent, and closed ideas. Your visitors can post, vote on and discuss these ideas in the community. While Omniconvert may be more focused on boosting conversions using A/B testing, it is also a great (and free!) tool for sending out VoC surveys. This tool simplifies how you do business by taking the results from these surveys and turning them into actionable insights and ideas. Omniconvert also includes a number of personalisation options so that you can create personalised messages and display them to your audience. Yelp is a very well-known internet review and rating website that is made for local businesses and restaurants. The tool uses long-form reviews to get detailed responses from reviewers. 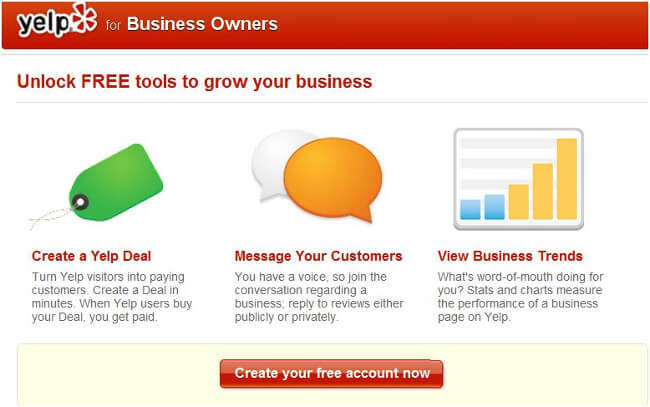 All your business has to to do is activate a Yelp business page. To boost the number of reviews you receive, you can also add a badge to your website that requests reviews, or send out a link in your company newsletters. And that’s right! Yelp offers a free suite of tools that allow you to respond to the reviews and track visitor engagement. TrustSpot supports company reviews, product reviews, or both! With this tool, users can make a profile page and create widgets for their website to collect reviews. TrustSpot also provides an integrated analytics functionality that gives users insight into how customers are engaging with emails (review requests). This tool offers standard integrations with various webshop systems such as Shopify and Magento. Yotpo positions itself as a customer content marketing platform, which solutions such as visual marketing, consumer insights and of course, reviews and ratings. This tool gives you the ability to convert more than 10% of your customers into reviewers! Email your customers, at a set time after purchase and encourage them to leave reviews for products they’ve purchased. You can also place Yotpo’s customisable widgets wherever you want on your own site. 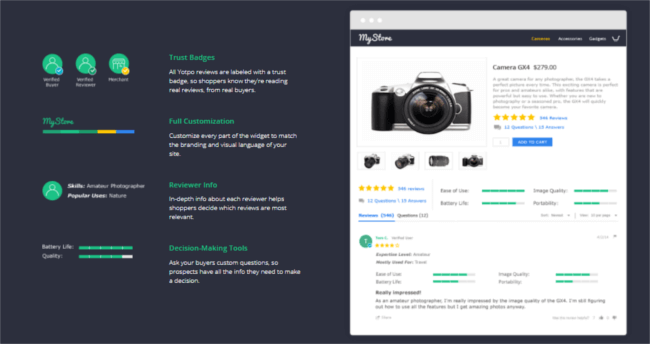 These widgets includes a trustbadge, in-depth info about the reviewer, and they allow you to ask your buyers questions that might help them make a decision. Perhaps one of the most popular types of tools are online survey tools. Often in the form of a feedback button or email invite, these tools have become quite popular since the emergence of website feedback. Some of these tools are focused on particular niches whereas others hone in on user experience. In the past, these feedback tools were well-known for their tendency to include a long list of questions, however nowadays, they are becoming shorter and shorter – which certainly makes them less of a hassle for respondents. The only thing is that many of these tools haven’t much to offer in terms of in-depth analytics. Zoho Survey provides their clients with a wide selection of built-in reports and interactive charts to help them analyze and comprehend the survey results and derive intelligent, actionable insights. Since Zoho Survey supports multiple languages, you can create surveys translated to more than 30 languages. Surveys can be shared on social media channels, embedded on your website or opened using a QR code. This tool is great for businesses who want to integrate their survey tool with a CRM (e.g. Zoho CRM). With this free user feedback solution, users can create, distribute, and interpret the results of polls, surveys, quizzes and ratings. Users can embed these surveys on their website quickly and easily or invite respondents via email. Once the data is collected, you can create filters to analyse the data and share it in reports. The results of these surveys can all be viewed in real-time. The free package, however, only offers room for one user, there are no export options and you cannot customise the look-and-feel of your surveys. Survey Monkey is a popular user feedback solution for creating surveys. Its free version provides you with unlimited surveys but does limit you to 10 questions per survey. Additionally, it’s easy-to-use user interface makes it easy to solicit input from your customers, users, and employees. This tool is perfect for one-off surveys, however this makes it less suitable in terms of measuring overall satisfaction or re-surveying customers again after a certain period of time. Google Forms is yet another free online survey software that allows its users to quickly and easily put together surveys via a drag & drop interface. In terms of design, these surveys can be entirely customised. The tool provides you with real-time response info and charts. This data can also be connected with other Google products. If you are more interested in capturing user input on particular webpage elements, then perhaps a visual feedback tool is something worth considering. Some provide the option submit a screenshot while others make use of virtual sticky notes that highlight certain elements on the page (e.g. text, images or buttons). Keep in mind, while these provide a lot of support in terms of design they are somewhat basic in terms of extracting deep customer experience insights. Mopin.io is a free visual feedback tool that enables its users to conduct user testing on new landing pages as well as website designs. This user feedback solution does not require any installation. All feedback is collected using a generated, shortened URL of the webpage you want to receive feedback on. You will receive feedback in your inbox. There is also the option to integrate with the Mopinion Suite (paid software). 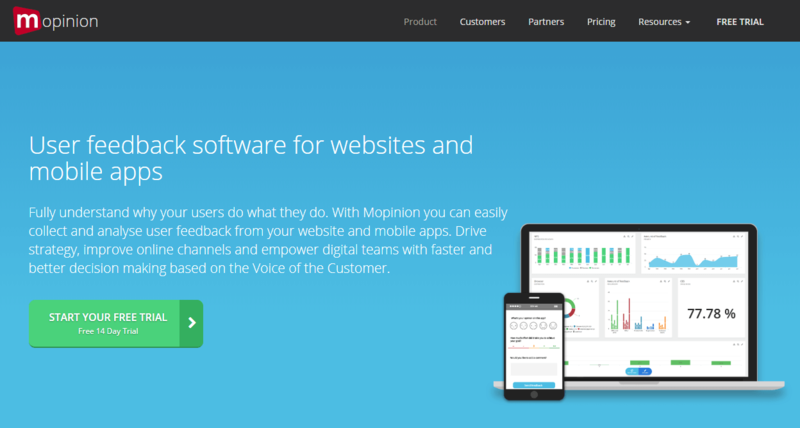 NOTE: mopin.io is developed by feedback software specialist Mopinion. 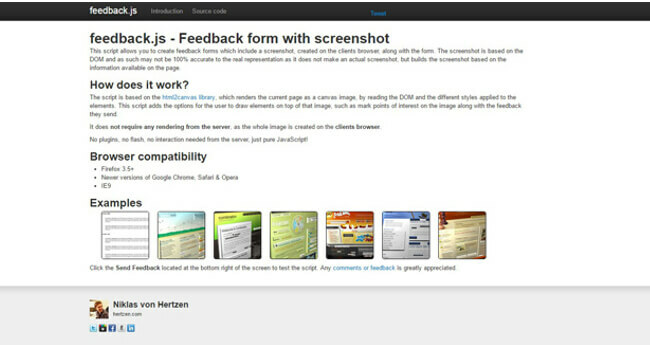 Saber is a visual feedback tool that allows you to easily highlight issues on your website. However, with this tool the notes you take are mainly based on selecting (highlighting) elements on the page and not so much aimed at making drawings and drawing arrows. This tool also saves the notes as a screenshot and sends it to you by email – but only when you opt for the paid version. With the free version you are quite limited (e.g. there are no screenshot options, third party integrations or customisation options). We hope this overview has given you some good insight into which free user feedback tools will help you create a more customer-centric approach – whether that may be through building trust, improving the customer experience or focusing on usability. Warning! Although these tools are free, you have probably noticed that they can’t provide you with much in terms of customisation, service, or even analysis features for that matter. But fear not! There are plenty of affordable tools, even for startups, that can help extract truly meaningful insights from your customer feedback. In-depth analysis, including text analytics, sentiment analysis, smart labeling, etc.